FREDNU » Blog Archive » Sweden, a US vassal state? You are here: Home - HEADLINE - Sweden, a US vassal state? 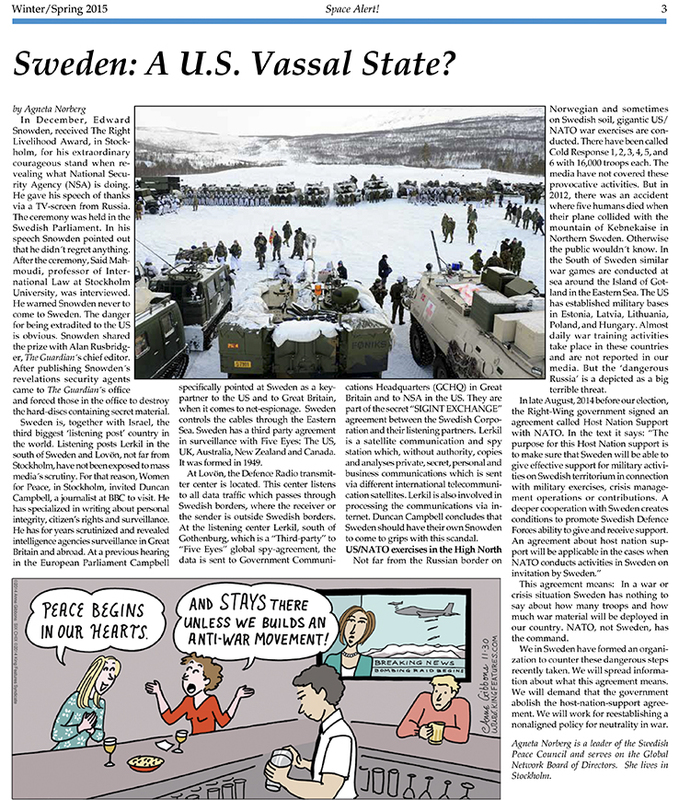 Sweden, a US vassal state? Posted by admin on August 28th, 2015 with Comments Off on Sweden, a US vassal state? Nyhetsbrevet Space Alert! Klicka på bilden för att ladda ner hela som pdf. In December, Edward Snowden, received The Right Livelihood A ward, in Stockholm, for his extraordinary courageous stand when revealing what National Security Agency (NSA) is doing. He gave his speech of thanks via a TV-screen from Russia. The ceremony was held in the Swedish Parliament. In his speech Snowden pointed out that he didn´t regret anything. After the ceremony, Said Mahmoudi, professor of International Law at Stockholm University , was interviewed. He warned Snowden never to come to Sweden. The danger for being extradited to the US is obvious. Snowden shared the prize with Alan Rusbridger, The Guardian ́s chief editor. After publishing Snowden ́s revelations security agents came to The Guardian ́s office and forced those in the office to destroy the hard-discs containing secret material. Sweden is, together with Israel, the third biggest ‘listening post’ country in the world. Listening posts Lerkil in the south of Sweden and Lovön, not far from Stockholm, have not been exposed to mass media ́s scrutiny. For that reason, Women for Peace, in Stockholm, invited Duncan Campbell, a journalist at BBC to visit. He has specialized in writing about personal integrity, citizen’s rights and surveillance. He has for years scrutinized and revealed intelligence agencies surveillance in Great Britain and abroad. At a previous hearing in the European Parliament Campbell specifically pointed at Sweden as a key- partner to the US and to Great Britain, when it comes to net-espionage. Sweden controls the cables through the Eastern Sea. Sweden has a third party agreement in surveillance with Five Eyes: The US, UK, Australia, New Zealand and Canada. It was formed in 1949. At Lovön, the Defence Radio transmit- ter center is located. This center listens to all data traffic which passes through Swedish borders, where the receiver or the sender is outside Swedish borders. At the listening center Lerkil, south of Gothenburg, which is a “Third-party” to “Five Eyes” global spy-agreement, the data is sent to Government Communications Headquarters (GCHQ) in Great Britain and to NSA in the US. They are part of the secret “SIGINT EXCHANGE” agreement between the Swedish Corporation and their listening partners. Lerkil is a satellite communication and spy station which, without authority, copies and analyses private, secret, personal and business communications which is sent via different international telecommunication satellites. Lerkil is also involved in processing the communications via internet. Duncan Campbell concludes that Sweden should have their own Snowden to come to grips with this scandal. Not far from the Russian border on Norwegian and sometimes on Swedish soil, gigantic US/ NATO war exercises are conducted. There have been called Cold Response 1, 2, 3, 4, 5, and 6 with 16,000 troops each. The media have not covered these provocative activities. But in 2012, there was an accident where five humans died when their plane collided with the mountain of Kebnekaise in Northern Sweden. Otherwise the public wouldn ́t know. In the South of Sweden similar war games are conducted at sea around the Island of Gotland in the Eastern Sea. The US has established military bases in Estonia, Latvia, Lithuania, Poland, and Hungary. Almost daily war training activities take place in these countries and are not reported in our media. But the ‘dangerous Russia’ is a depicted as a big terrible threat. This agreement means: In a war or crisis situation Sweden has nothing to say about how many troops and how much war material will be deployed in our country. NATO, not Sweden, has the command. We in Sweden have formed an organi- zation to counter these dangerous steps recently taken. We will spread information about what this agreement means. We will demand that the government abolish the host-nation-support agreement. We will work for reestablishing a nonaligned policy for neutrality in war. Agneta Norberg is a leader of the Swedish Peace Council and serves on the Global Network Board of Directors. She lives in Stockholm.